The short answer to this question is just this: pray as you would normally, but look at sacred art as you do it. Good sacred art will promote a right attitude through the combination of content, compositional design, and stylistic elements. In this sense, the artist does the hard work in advance to make it easy and natural for us. I am currently reading a new book on Newman which has recently come to my notice. 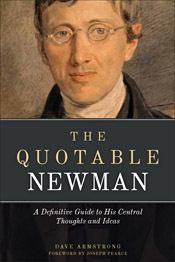 It is The Quotable Newman - Definitive Guide to His Central Thoughts and Ideas. Published by Sophia Press it is compiled by Dave Armstrong with a forward written by Joseph Pearce. It is arranged by topic in alphabetical order, over 100 of them taken from 40 different documents, and under each topic, for example, Original Sin, the Fall of Man there are a series of quotations, usually up to a couple of paragraphs long on each topic. To someone like me who does not know the full body of Newman's well (to put it mildly) this arrangement is helpful. It seems to me that I can access directly and quickly what Newman actually said and then if I wish to investigate further, seek elsewhere the document in full via the reference. This is otherwise difficult because the titles of the documents do not always tell you what he is speaking about eg Letter to the Duke of Norfolk. I cannot comment on the differences between northern and southern Catholics, but I think his observation about many of the Catholics I see is still very true today. 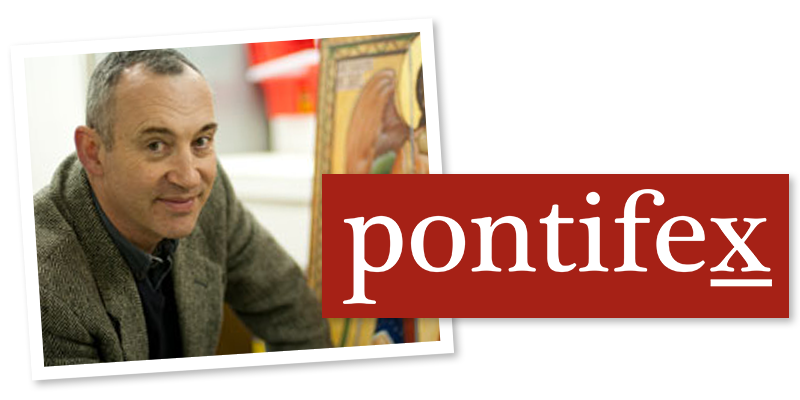 The contrast between how Eastern Catholics, such as the Melkites, engage with the images of the saints as they pray to them, struck me long ago. The Easterners tend to turn and facing them as though the person was there and addressing the saint by looking at his face - this becomes part of the activity of liturgical worship. Whereas, in the Roman Rite churches, even if beautifully adorned, there is much less obvious direct engagement with the image. Even if Mary's image is there, I don't see people looking at her as they pray and when she is addressed by name in the same way. 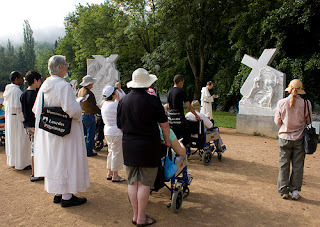 It isn't the only way to pray of course and there are devotions in which the image is an integral part, such as the Stations of the Cross; but the general lack is telling, I think. This is something that I think has a profound effect on the culture. 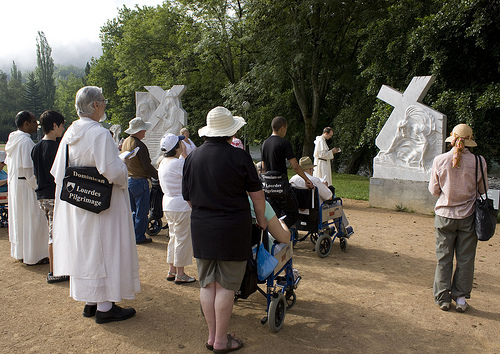 The the more our senses, including the visual, are engaged directly during prayer with beauty that supports and intensifies our prayer, not only will it encourage the right interior disposition, but it profoundly forms our taste and sense of the beautiful, so changing what we choose and delight in outside the church. This, I believe, is how the culture of faith and wider culture can be powerfully connected again. In the Spirit of the Liturgy, Pope Benedict XVI talks of this separation of the two cultures and how serious this is. He says that this happened by the 19th century, when Newman lived. Beauty calls us to itself and then beyond, to the source of all beauty, God. God's creation is beautiful, and God made us to apprehend it so that we might see Him through it. The choice of images for our prayer, therefore, is important. 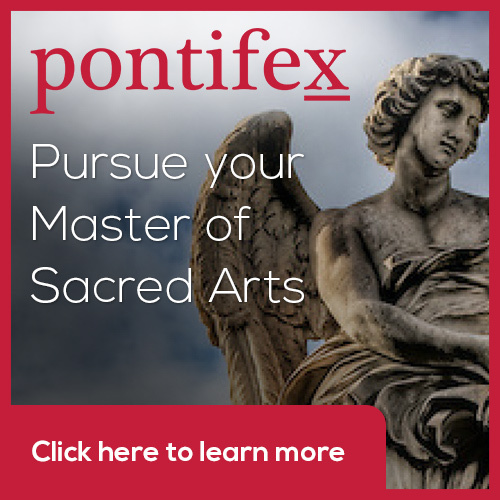 Beautiful sacred imagery not only aids the process of prayer, but what we pray with influences profoundly our taste: praying with beautiful sacred art is the most powerful education in beauty that there is. In the end this is how we shape our culture, especially so when this is rooted in family prayer. The icon corner will help us to do that. I am using icon here in the broadest sense of the term, referring to a sacred image that depicts the likeness of the person portrayed. So one could as easily choose Byzantine, gothic or even baroque styles. The contemplation of sacred imagery is rooted in man’s nature. This was made clear by the 7th Ecumenical Council, at Nicea. Through the veneration icons, our imagination takes us tothe person depicted. The veneration of icons, therefore, serves to stimulation and purify the imagination as a means of imaging God’s inspiration. This is discussed in the writings of Theodore the Studite (759-826AD), who was one of the main theologians who contributed to the resolution of the iconoclastic controversy.